Deer are among the most widely dispersed large wild animals in North America. They are also one of the most persistent foragers and natural enemies to a farmer’s garden. Fencing is the only sure way to keep deer out of a garden, according to the University of Minnesota. 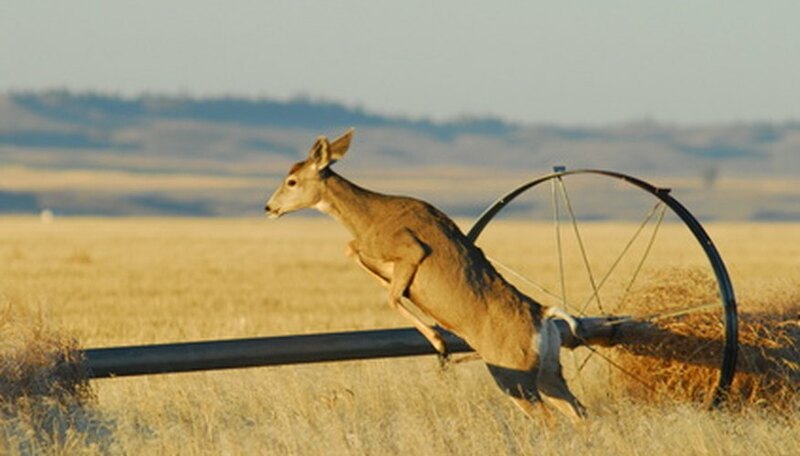 Deer are naturally hesitant to enter an enclosed space, so even a small fence will help to deter deer. The most effective fences are 8 to 10 feet high and constructed of wire. Lay out the path for your fence by driving stakes into the corners of your property. Tie string between the stakes to help determine the path of your straight fence rows. Dig fence post holes that are 2 feet deep. Space each post 10 feet apart. Fill the post holes 1/3 full of gravel. Mix concrete and water in a bucket until it is the consistency of gravel. Set posts into the post holes and tilt them outward by 30 degrees. Pour the concrete mix into the holes. Allow the concrete to dry before continuing. The tilted fence creates an additional psychological barrier to deer. Position cattle panels between each fence and nail them into place with fencing staples. Stretch two rows of 12-gauge wire across the top of the fence at 1-foot intervals. Hammer these into place with fencing staples. Wrap the wire twice around the end posts and then wrap the loose ends twice around the stretched wire before cutting the loose ends. Screw electrical wire anchors into the fence posts facing outward. Locate each anchor 4 feet from the ground. Stretch electrical wire through each anchor. Attach the wire to the electrical box and mount the box on the end post. Cut foil into strips. Wrap each strip around the electrical wire and spread peanut butter over it to attract deer. Plug in and activate the electrical box. The deer will be attracted to the peanut butter. When they attempt to taste it, they will be shocked by the foil and wire and will be driven away.